Fuji already makes an XF 55-200mm f/3.5-4.8 consumer zoom, but the Fuji XF50-140mm F2.8 is designed for a much more serious type of user. Fuji's X-series compact system camera bodies like the X-Pro 1 and X-T1 have earned serious respect among photographers, but for cameras like these to make any impact they have to be backed up by a solid range of lenses. And they don't come more solid-looking than this new pro-orientated telephoto zoom. The zoom range is shorter than the existing 55-200mm, but you get a maximum aperture of f/2.8 at any zoom setting, making this lens ideal for low light shooting and fast shutter speeds. 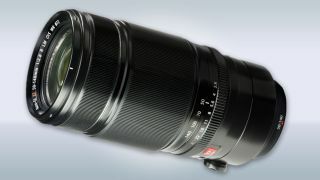 The "LM" stands for "linear motor," or "triple linear motor" in the case of this lens. It's a world first, Fuji says, and delivers faster, quieter autofocus. "OIS" stands for "optical image stabilisation," which Fuji claims is the best in its class, including a high-performance gyroscopic mechanism and a "unique algorithm" which corrects drift due to temperature changes. "WR" stands for "weather resistant." The new lens will also keep out dust and keep working down to a temperature of -10 degrees. Fuji's expanding lens range is pushing its compact system cameras out of consumer territory and into the ranks of professional gear. Needless to say, all this sophistication doesn't come cheap. When the 50-140mm goes on sale in November 2014 it will cost £1,250 (US$1,600). That sounds a lot, but actually it isn't. Compared to similar pro lenses from the likes of Canon and Nikon, the new Fuji lens looks a fair deal - especially if it proves to be as good as it sounds.